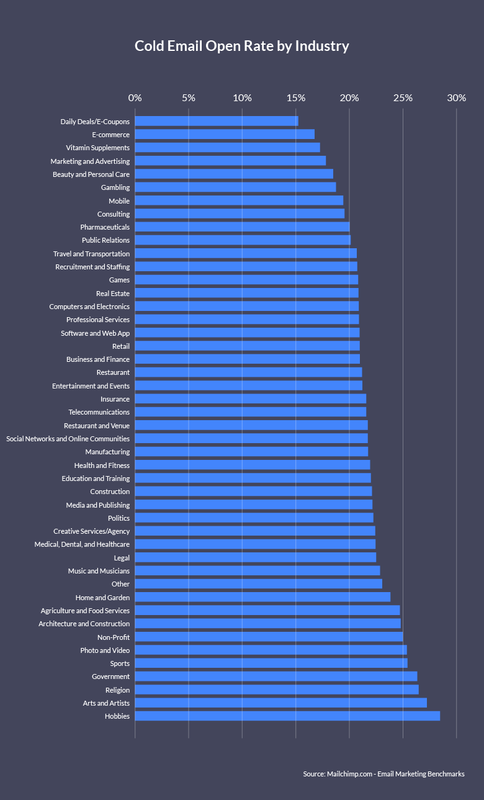 The most opened emails are related to hobbies, with an open rate of 27.35%. Emails sent by government entities come in second, with a 26.52% open rate. With a 26.03% open rate, emails about the arts and artists came in third. The average open rate for all industries analyzed is 20.81%. 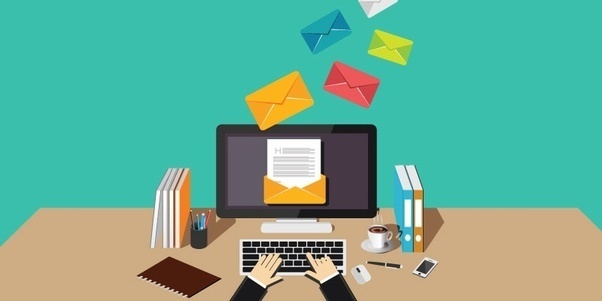 The email channel is one of the primary ways B2B marketers are connecting to potential business clients. There are distinct differences with sending cold B2B emails verse warm emails. Cold emails are when there is no prior relationship between the respondent and the sender. Warm emails are when there has been some sort of contact via the telephone, direct mail, or social media. Personalization – You must include the recipients name – First Name and/or Last Name somewhere in the email. Most email broadcast systems allow you to insert the recipients name somewhere in the email. The best place is at the start of your message ie Dear Andrew.. or their name can be added in the sender area where their email address goes ie To: Andrew. Use your personal email address in the From field and if the email is in a letter format then sign off with your name and details in the signature. If you can add a photo of yourself – even better. Many companies are including personal videos. The importance of this is that you are showing the recipient you are a real person. Do your research on who you are sending the email to. You must target your message tightly. If you are wanting to contact CFO’s from the major retail industry your writing tone will be different than talking to Social Media Managers. The subject line should reflect this. Offer Value. What value does your service or offer have for the client? Sound Credible. Are you an expert in your field or just a Sales person trying to sell stuff? Focus on Benefits v Features. What’s in it for the customer? How will it benefit their company? Track the email and links. How many emails were opened? Did people click on your links to your website, free white paper, landing page etc. Those who clicked the links can be resent another email with further information. Don’t try and sell anything. The purpose of a cold email is to open a dialogue,or get an appointment. You will never sell anything in a B2B cold email. Must have a call to action. ie request an appointment, telephone hookup, download white paper etc. Most importantly your email must give off the feeling of trying to start a long term relationship with the prospect – not just a quick hard sell. Marketing can get very confusing sometimes as we try and implement the different concepts in growing our business and keeping our customers happy within the digital age. This week I came across a very simple chart that states what a company must do in the marketing cycle to attract and keep buyers. 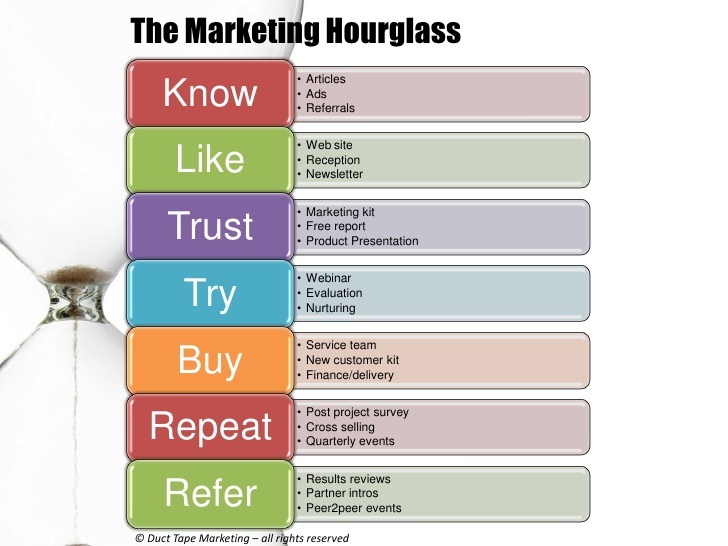 We must spend time and money on the Know, Like and Trust stage before moving to the buy stage. For many businesses this means a consistent stream of quality information about the company and its services available via inbound and/or outbound marketing. If the customer knows you exist then gets a good feel for your company- trust will form. Once trust is created the probability of them buying your services or products is very high. The key to all marketing is once the Know, Like and Trust is established then, and only then, can you start selling them something. Most people who do research for available data start looking at their targeted Industry segment as a keyword in google. This will produce 1000’s of entries – some related and most non-related to the industry or business segment the buyer is trying target. They will then research a few on-line directories such as the Yellow pages. This will give them again 1000’s of record results- some relevant- some not so relevant. By now the buyer is getting a somewhat inflated figure in their heads of how many companies might be in their target market. Here is a table that summarises these numbers. So as these statistics reveal the total number of businesses in Australia with people working in them ( as opposed to just company name, trusts etc ) comes to approx 850,000. Of these 600,000 are below 5 employees.200,000 businesses have 5-20 employees and approx. 55,000 with 20+ employees. You can see if we then select specific industry segments within the employee bands we end up with surprising results. The other issue with comparing different data sources is that to run an effective B2B campaign you must contact or speak to a real person within the company ie the Decision Maker. Directories, Yellow Pages and Google searches will only provide you with the business name, address and maybe the telephone number however not the name of a contact in the company to talk to. Also with these on-line directories, there is no way of knowing the employee or revenue size of the business. A 2016 DMA study found that 5.3% of house-list recipients responded to direct-mail pieces; 2.9% of prospect-list recipients did the same. Compare this to the results for online display (0.9%), email (0.6% for house/0.3% for prospect), social media,(0.6%), and paid search (0.5%). The results aren’t nearly as enticing. Want to know more – Download the report here.